German aircraft sink destroyers Codrington at Dover and Wren off the Suffolk coast. Japan announces its plans for the creation of the Greater East Asia Co-Prosperity Sphere. London is severely bombed by the Luftwaffe, in its first air raid for 10 weeks. German troops liberate Tallinn, the capital of Estonia. Guderian’s Panzer Group 2 is removed from its subordination to von Kluge’s 4th Army and put directly under the control of Army Group Centre. This is due to severe disagreements between the von Kluge and Guderian, which are disabling operations. Fierce battles rage 25 miles to the east of Smolensk. Peru takes Puerto Bolivar, Ecuador in first paratroop combat in western hemisphere. German troops take Bataysk, and 6th Army launches an attack to destroy the soviet bridgehead west at Kalach. 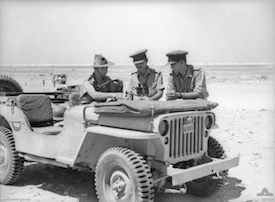 British press attack at El Alamein, but fail to make gains against Germans. Australian Women’s Land Army formed for agricultural workers. The liberation of Mussolini, the occupation of Rome and Italy, plus the capture of the Italian fleet is decided upon by the German High Command. Mussolini himself is transferred from Rome to the Island of Ponza. Heavy fighting continues in Sicily, leading Kesselring to order preparations for the evacuation of the island. U.S. troops breakthrough at St. Lo, forcing a general German withdrawal from Normandy toward the river Seine. The Russians take Lvov, Dunaburg and Bialystok and secure a major bridgehead over the Magnuszew River. FurtherÂ gains are also made in Baltic States. Chinese retake Kweilin from Japanese in southeast China.